Jicama is a juicy, crispy, and sweet edible root with a yellowish paper like skin. Sometimes it is referred to as yam bean. In Southeast Asia, it is commonly known as bang kuang and is an essential ingredient for making spring rolls. Jicama is excellent eaten raw and is a superb snack. It also lends itself well in salads. I like to prepare this Warm Jicama and Cabbage Salad in the warmer months. It is great as a filling for lettuce wrap. Ingredients such as minced pork and mushrooms are often included but I like to keep it light with just a little shrimp for added sweetness. This recipe is based on a very popular Nyonya recipe, Jiu Hu Char (Stir Fry Jicama with Cuttlefish) which is often served during the Chinese New Year. Jiu Hu Char is more traditional and uses more ingredients. I think both are equally tasty. Half shrimp lengthwise so that it will curl when cooked. Peel jicama and grate into fine strips using a box grater. Do the same for carrots. In a wok or large pan, heat vegetable oil. Add garlic and onions and fry until fragrant. Add shredded jicama, carrots, and cabbage. Stir to mix well. Add salt and pepper and continue to cook for about 15 minutes over medium low heat. Remove and serve warm with lettuce leaves if preferred. Spoon Warm Jicama and Cabbage Salad onto lettuce leaves. Roll up and enjoy. Yum! This looks delicious! It looks like a perfect summer meal! Mmm…I love using lettuce as wraps. It adds the perfect crunch and a refreshing bite. Your dish sounds delicious! I would definitely prefer to use shrimp over pork as I'm not a big fan of pork. This sounds great! I wish that jicama was available in Bulgaria. I love your iceburg lettuce bowl. Thanks for sharing. that sounds a very exotic ingredient and the dish looks very light and summer friendly. between was exploring your site and loved the way you explained sushi…you have a real nice blog Biren…very informative and lovely pictures. This looks very delicious and great to make poh piah or wraps. It's quite difficult to find bang kwang here. I really love the Penang poh piah…oooh….so delicious! this looks really delicious n inviting.. I'm going to search everywhere for jicama now. And I'll remember to not pronounce the J. Sounds lovely.I do not think I have jicama like that before. This is too funny! I just made this same salad last night. It was a Bobby Flay recipe that has chili spices in it. I like yours better! A scrumptious salad! I love the addition of shrimp! @Kathleen – Yes, it's nice and light for summer. @sweetlife – Thanks for visiting and for the nice comments! 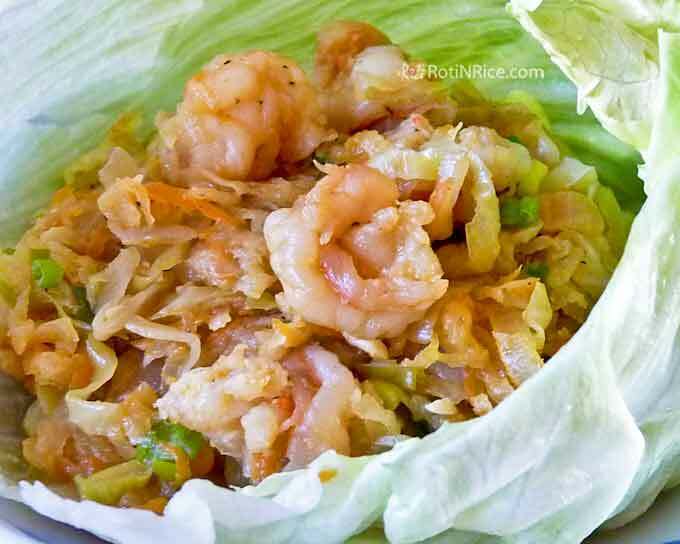 lequan@luvtoeat – Lettuce wraps are great! We do that a lot even way back when I was little. Mom use to make this dish and we always had it with lettuce. denise@quickies on the dinner table – I like it with shrimps too. 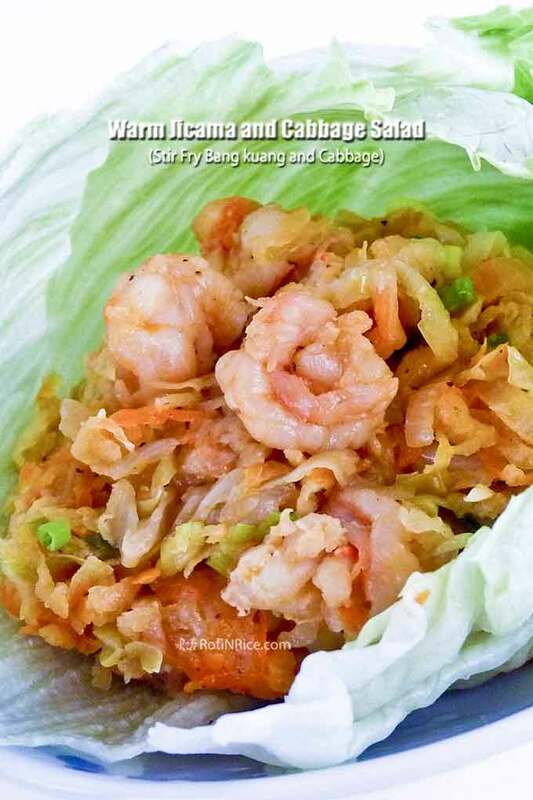 Whenever I make this, I know what my boys are thinking of…..spring rolls! @Sayantani – Thanks for visiting and for your lovely comments. You've made my day! @MaryMoh – Good thing jicama is easily available here. I sometimes eat it like a fruit. Love the juicy, crunchy taste. I have even cooked it in a soup with carrots….very light, sweet, and delicious. @Subhie Arun – Thank you. @motherrimmy – Aahhh…great minds think alike! I'll have to check out his recipe. I've never had cooked it with chili spices but we do spread a mix of sweet sauce and chili sauce on the lettuce before putting the salad on it. 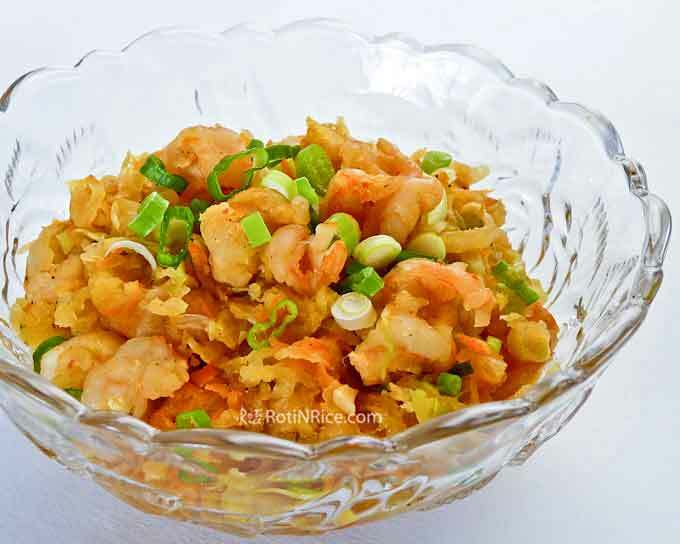 @5 Star Foodie – The shrimps do add sweetness to the dish. Such a simple yet healthy recipe. It looks so delicious for a healthy dish. 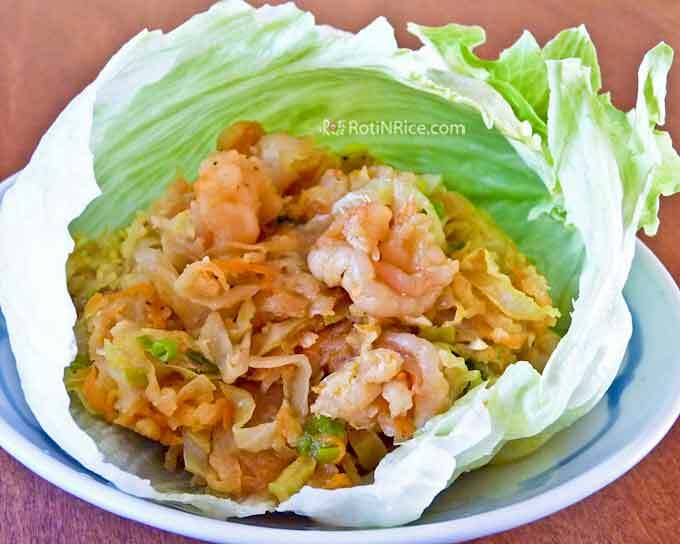 Love the use of lettuce as wraps as there's a Chinese minced pork dish that is eaten this way too. Oh my, I love jicama, haven't served it in quite some time, shame on me. This sounds and looks great. I will be trying this asap! I heart jicama. How can it not be liked? Great, flavorful looking salad and so versatile…I'd like to try it with the pork & mushrooms! I love Jicama and your salad looks so mouth watering!! Cabbage salad looks healthy as well as delicious! It looks delicious and I will have to give it a try! Love that cabbage! Great background for your blog also. Very unique! @Xiao Yen Recipes – Thanks for visiting and for your nice comments. Yes, I do know that minced pork dish. It is very tasty. @redkathy – I love jicama too and sometimes take it as a snack….so sweet and crunchy. @Cristina (TeenieCakes) – I like jicama too. My mom cooks it with pork and mushrooms and it is delicious. @tigerfish – That's true, jicama is often used in spring rolls. @Spicie Foodie – It will be interesting to see how it is used in Mexican food. @shahana – It is a light and refreshing salad.